KRAKOW, Poland (CNS) — Baptiste Milani’s flag pole topped with the French flag reached higher than any of the others near the entrance to Blonia Park. 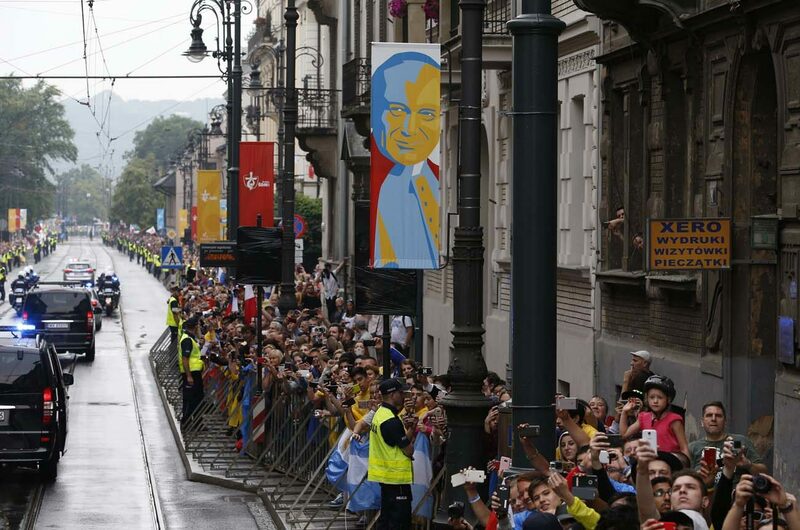 “We wanted to make sure the pope saw it,” he said moments after the popemobile with Pope Francis aboard drove past his location July 28, far from the main stage where the welcome ceremonies for World Youth Day were to take place. A friend from his Paris parish, Our Lady of Labor, said she managed to tip the flag low enough to touch the well-known white vehicle as it bobbed on a temporary road made of a large rubber mat. Milani, a seminarian, told Catholic News Service that he and 10 other parishioners wanted to travel to Poland to celebrate being young. “It’s an event in which the church meets Christ. It’s a meeting with the whole church. It’s a way for young people to go deeper in their faith,” he told Catholic News Service. Closer to the steel barricades along the roadway, Sister Sobe, of Haiti, said being able to welcome Pope Francis was a “really nice feeling.” A member of the Daughters of Divine Love, Sister Sobe said she and a group of 130 Haitians who made the trip to Krakow had enjoyed interacting with other Catholics from around the world. “We’re sharing our faith together,” she said. Next to the Haitians, a group of Australians, including members of indigenous communities, were excited to have seen Pope Francis pass by. Many in the group of 54 — indigenous and non-indigenous alike — had painted a white line bordered by yellow dots around their eyes. Troy Mardigan, 20, an artist who belongs to St. Francis Xavier Parish in Daly River in the Northern Territory, said he wanted to join with other young people to see how Jesus is worshipped across cultures. Plus, he wanted to see Pope Francis. “This means everything to me,” he said. Irene Arroyo, 61, of Quezon City, Philippines, excitedly awaited the popemobile’s appearance. Meanwhile, her husband was photographing the thousands of people from around the world in the crowd, making sure his camera was set just right for the big moment under dark gray skies. Why fight the crowds and overwhelming energy of thousands of young people at her age? “I would just like to witness people of the same faith sharing together, caring, loving and praying with the pope in this year of mercy,” Arroyo explained. 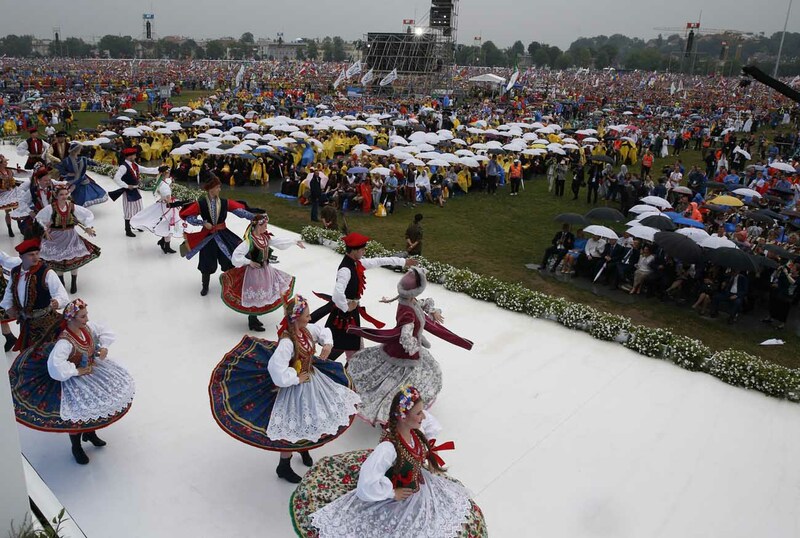 Minutes before the pope’s arrival at the two-hour ceremony, Anuncio — two drummers, a cymbalist, two trumpeters and a trombonist — performed, and about 50 people danced to the music as a light rain fell. Benjamin Massif, 32, one of the group’s two drummers, said the contingent wanted to play loud enough so Pope Francis could hear their music. The group plays for the love of music and the love of God, he said. Not all of the excitement was occurring in the park. Poles and foreign visitors joined World Youth Day pilgrims in crowds up to eight people deep on sidewalks along both sides of Pilsudskiego Road, waiting for the pope to pass by in one of the city’s trams. “He’s a special man. I’m looking for a blessing from him,” said Marilia Tegacim of Sao Paulo. Tom and Joanna Miodek of Krakow stood under a tree, partially protected from the rain, to see Pope Francis. Tom Miodek said the pope’s visit was big for the city. “It’s exciting. It’s very important for Krakow and Poland and all Catholics,” he told CNS. Once the pope’s tram passed, the Miodeks planned to walk into the Old City to welcome young pilgrims to World Youth Day and “find a church and invite them to pray” for the success of the festival of faith. Steps away, Ivars Cubatjuks, 16, of Lielarde, Latvia, was waiting with his parents and 9-year-old brother for the pope. He said they were vacationing in Krakow and decided to greet Pope Francis.